Paris St-Germain warmed up for their Champions League match at Liverpool by cruising past Saint-Etienne in Ligue 1. 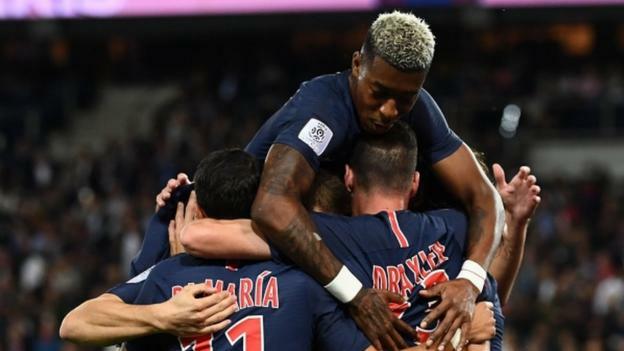 PSG were without suspended striker Kylian Mbappe and rested forward Neymar but went ahead through Julian Draxler’s header in the 23rd minute. Edinson Cavani scored a 51st-minute penalty after he had been fouled in the area before winger Angel di Maria and Moussa Diaby added goals late on. The French champions face Liverpool at Anfield on Tuesday. Like in PSG’s previous two games, goalkeeper Gianluigi Buffon was left on the bench with 25-year-old Frenchman Alphonse Areola preferred in goal. Shortly after Di Maria added PSG’s third, manager Thomas Tuchel substituted centre-back Thiago Silva who had received treatment for a knock earlier in the second half. The win maintains the French champions’ 100% start to the season and keeps them top of Ligue 1. They have scored at least three goals in all of their five league games this season, netting 17 in total.